5 TERRIFYING ATTRACTIONS! ONE LOCATION! 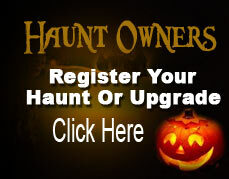 Haunted Hayride of Terror, 3D Haunted Barn, The Haunted Wooded Trail, The Living Maze, Marlboro Zombie Paintball. Open every Friday & Saturday from September 28 through October 28 at 7:00 pm; ticket sales begin at 6:30 pm & end at 11:00 pm, but the haunted attraction stays open until the last soul has exited. Open every Sunday in October and Halloween Night at 7:00 pm; ticket sales begin at 6:30 pm & end at 10:00 pm, but the haunted attraction stays open until the last soul has exited. Military & Law Enforcement Nights: Every Sunday we are open - get $7.00 off admission with valid ID!